$55.95 As Low As $0.99 ea. Set of classic flat note cards with blank matching envelopes. Your choice of triple thick stock and raised ink color. Size 8.5" x 4.5". 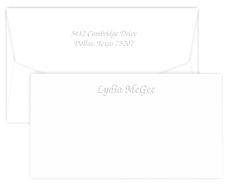 Printed return address and lining options available. Positioning and typestyle as shown.